Say you’re a restaurant or coffee shop like Burger King or Starbucks. Your fans are multitude and they know you, everything you publish about yourself, but do you really know who sits at your table? Are you looking at what they publish? You have a relationship with them but it’s a bit one-directional. Social media profiling can make it more of a dialogue. Gain deep knowledge of what each of your fans really like, their personality in all its facets, and their behavior: what they do, the places they like to visit. Get a snapshot of their likes, comments, their social connections… What is their favorite food? Do they prefer tea or coffee, hamburgers or pizza, dairy or soy milk? Which other restaurants do they go to? Now that Wi-Fi is a commodity, savvy restaurants are using social login to complement their CRM databases. With Xeerpa, you’ll also be able to analyse the food, cultural, fashion, and lifestyle preferences of customers and fans to personalize marketing campaigns and enhance user experience at the restaurants, websites or apps for mobile devices, enabling a more finely-tuned approach to your DMP, CRM, and customer management. Social login and Xeerpa can provide your business with very relevant information about the food, drinks, and overall preferences of your fans and customers. How many people seem to prefer a vegan diet? Or many would prefer a soy latte? Does your menu reflect that reality? Maybe a lot of your customers are interested in healthy foods, but they’re underrepresented in your kitchen, or maybe they would like to see more ice cream options on your menu. Imagine you plan to produce a TV ad featuring a popular song. Social profiling can help you find out which artist might appeal to your fans and target audience. Maybe your fast food chain is considering sponsoring a sporting event. Wouldn’t it be useful to know what sports and athletes your clients are in to? It goes without saying that when eating out we tend to choose places because of their food and also to have a good time. Traditional restaurants strive to make their customers feel special in all ways: remembering their preferences, special dates, family circumstances and putting a lot of effort into cultivating customer loyalty. 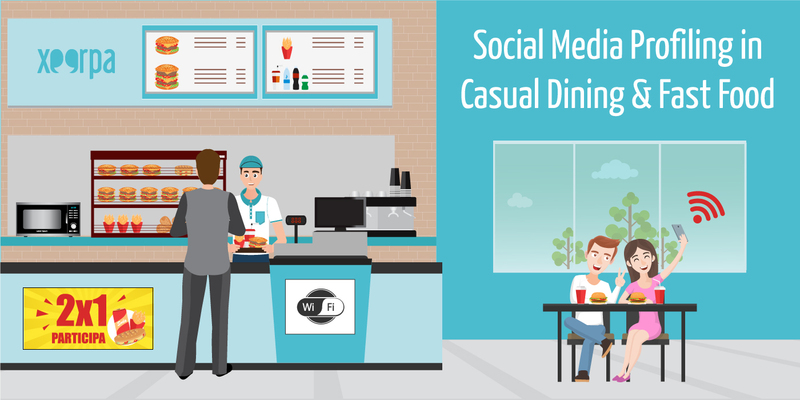 It is something casual dining restaurants and coffee and fast food chains may also start doing if you make use social CRM well (and there’s no risk that you lose your customer data if your head waiter or chef leaves :)). Rodilla analysed gastronomic, cultural, fashion, and lifestyle preferences of their clients, using these insights to personalise marketing campaigns and user experience in their apps and restaurants. Xeerpa collects customer data organically, through social login implemented in Rodilla’s e-commerce, promotions and Wi-Fi hotspots available across all their restaurants. Our real time analytical engine allows Rodilla to complement their salesforce CRM with the social network profiles of their users and fans, providing a 360º picture of both their customers’ transactional behavior, social interests, and affinity with Group Damm’s brands, competitors, and partners.